The first day of your honeymoon at Bali will begin with your arrival at Nugrah Rai Airport located on the island. Our representative will be waiting to greet you and transfer you to your hotel and ensure the check-in formalities go off smoothly. Thereafter, you are free to explore the city and neighbouring areas. You can contact our representative for more details on Bali travel packages that cost additional. After a good night’s rest, you can enjoy a wholesome and delicious breakfast at the hotel and spend time exploring what the hotel has to offer, as your morning will be free. In the afternoon, you will head to the elephant camp where you will marvel the panoramic landscape and also set out for a 30-minute trek along the valley’s edge to calm and relax you. Be sure to carry your binoculars as you could spot colourful tropical birds and monkeys swinging from branch to branch. The trek finishes at Trunk n Mahout Café, where you will pause for a leisurely lunch. You can then continue the tour to Ubud, where you will get an opportunity to mingle with local villagers and enjoy experiencing traditional village life and culture. After breakfast at your hotel, you will head to Tanjung Benoa for exciting water sports, like parasailing and banana boat ride. Just remember the banana boat ride requires five people before the boat heads into deep waters. After this adventurous and exciting experience, you will head back to your hotel to soothe yourself with Jerami Signature Spa treatments. After three nights, on the fourth day, you will enjoy a luxurious breakfast at your hotel and then leave for the airport to catch your flight home and begin your life as a happily married couple. If you are wondering about a Bali tour package for honeymoon, you are going in the right direction. It is the ideal honeymoon destination and most honeymooners have ranked this Indonesian island as one of the most romantic places on earth. This tropical island has it all - oodles of sunshine, mountains of happiness, abundant natural beauty and the right amount of romance, just the ingredients newlyweds require to begin their new journey in life together. Watching sunsets together or taking a tour of Ubud with its active volcano, rice paddy fields and macaque-filled forest make a complete Bali tour package for a couple. Of course, the temples of Bali are legendary and you can visit them to seek blessings from the presiding deity so that you have an enriched and fertile married life. After the stress of arranging your wedding, the last thing you need is the unforgettable honeymoon trip. That is why you should rely on a professional to ensure every aspect of your honeymoon is perfect. This is where we come in with our romantic and fun Bali Indonesia honeymoon package. Our Bali honeymoon packages are all-inclusive, and this means you have nothing to get worried about. We handle everything on your behalf, right from transportation to sightseeing. 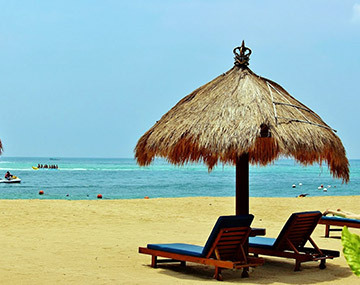 You will be surprised to learn that our Bali honeymoon packages from India are affordably priced and offer you destinations and itinerary that you can truly enjoy with your new spouse. You can write your own Bali love story as you spend three nights and four days steeped in romance and discovery. High season surcharges will be applicable. Rooms/Seats are subject to availability at the time of booking. Kindly note that the drivers are not guides. We will not be liable for claims and expenses arising due to circumstances beyond our control, like accidents and injuries, delayed flights, cancelled flights and acts of nature. I planned to go Bali and Bookotrip arranged a packaged for me. The trip was so nice but the best thing was parasailing What an adventure. For Booking Information / Reservations, Please Fill The Form.